To make sure that our customers receive unbiased feedback about our products, we use Feefo. Feefo is an independed website where customers can leave their product reviews so customers can make an informed decision before they purchase. We offer a number of financing options for your purchase. Zippay, ZipMoney and Skye 6 months interest free finance. Just select your preferred finance option at checkout! 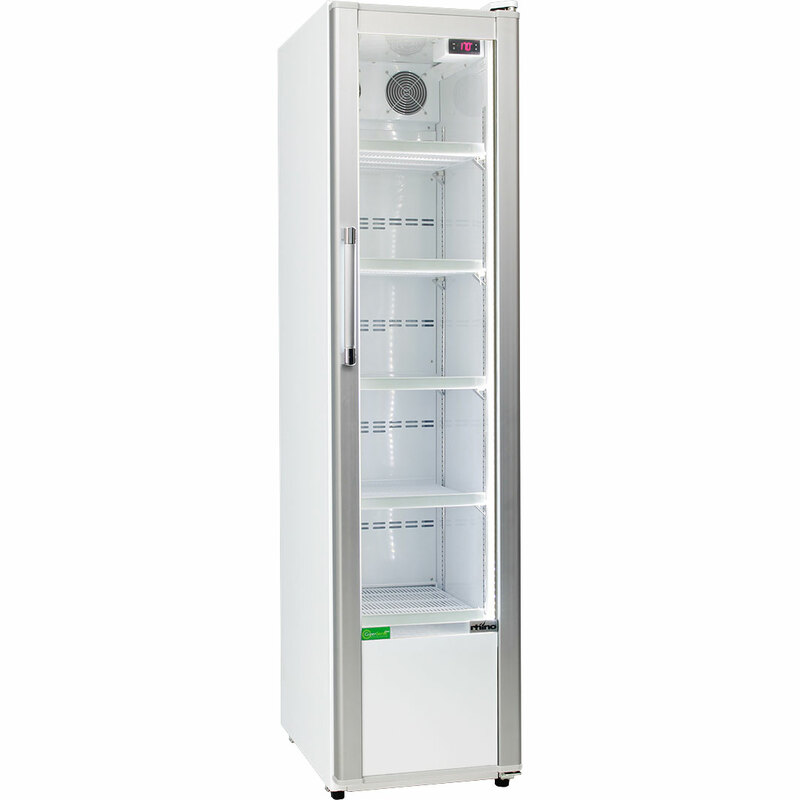 "Energy efficient Rhino slimline 300 litre commercial upright bar fridge made from brand parts and designed to stay in service for a long time." Lets look at the nuts and bolts! 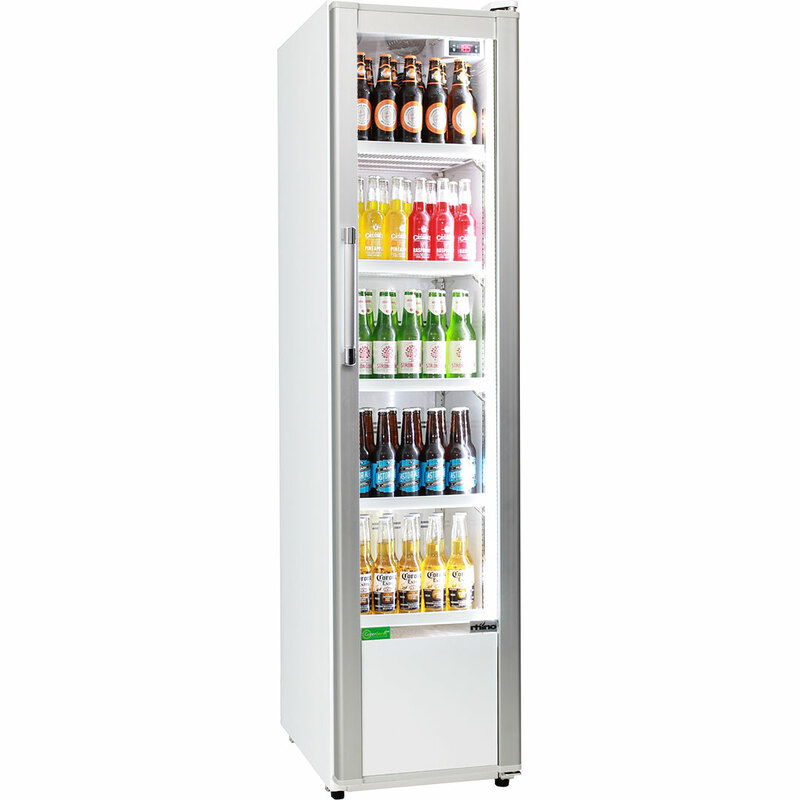 Rhino Energy Efficient Upright Skinny Commercial Bar Fridge. Using brand name parts including German EBM fans and Danfoss ECO Controller give you a product designed to last the distance, completely re-engineered to suit tough climates and busy retail venues. The energy efficiency is amazing for a fridge over 300Litre Capacity. Excellent fan forced cooling tropical rated with triple glazing, cold drinks no probems in 38oC+. Rhino has long been a world leader in commercial refrigeration and are now number 1 in energy efficiency technologies, it's why they are the preferred supplier to large corporate groups like Heineken and Fosters Group. Rhino commercial product works well and is reliable. Brand parts really mean a lot with commercial units, German EBM EC fans and Danfoss controller, Taiwanese transformers and famous 'ZEL' brand compressor. Can be fitted with gravity feed shelving. Great for busy retail outlets. We use feefo.com to independently aggregate our product reviews so you can read unbiased feedback from people who have bought the same product. 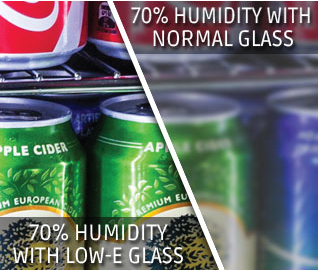 Energy consumption is probably one of the most important factors in buying a glass door fridge, due to the nature of being a ‘glass door’ it is not uncommon for 2 x fridges that ‘look’ the same to have up to 4 x times the difference in power consumption. One area that confuses here is that glass door drinks fridges are classified as ‘commercial’, meaning they do not require energy consumption labels. This makes it hard for the consumer to try to compare as there is no ‘set’ way to advertise power consumption unless the units have had MEPS testing done and results then show online. MEPS is usually only done when food needs to be stored in the fridges, it’s an expensive test but to advertise units as OK for food storage it has to be done. If units are only being advertised and sold as ‘drinks fridges’ then MEPS is not required, meaning that anyone can import a fridge and sell as a drinks fridge with NO requirement to abide by any energy consumption standard. This means there are so many units that draw plenty of energy and no way for the average punter to know. The parts that draw the most power are mainly the compressor, lighting and fans, so with these 3 things you can focus on consumption based on what is used. Generally brand name parts are better rated than cheaper no name fans and compressors. Lighting other than LED will draw more, LED is long lasting and reliable and is commonly used now in a lot of fridges. Although parts play a major factor, the function and ‘refrigeration balance’ of the unit also dictates a lot in how much energy is used. A fridge that is ‘balanced’ well will chill quicker and hence draw less energy, a fridge poorly designed will need to run more to get to temperature. 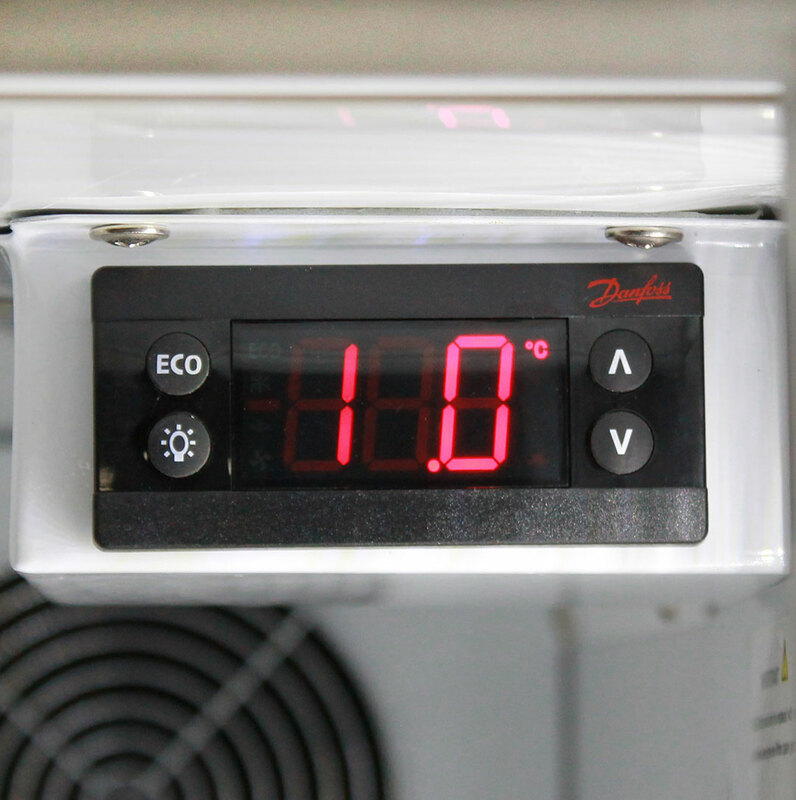 You will find a lot of cheaper units can’t handle ‘hotter ambient’ temperatures, they struggle and run for much longer to get to desired temperature, hence can use extraordinary amounts of energy. Some of the tests we have done on other units in market in our test room were frightening! After doing this since 1996, I have learnt so much and I can honestly say that 90% of factories in China really have no idea what they are doing in regard to ‘balancing fridge systems’ with correct compressor and correct sized parts to suit the units to run efficiently. So in short there really is a difference between fridges that look the same. 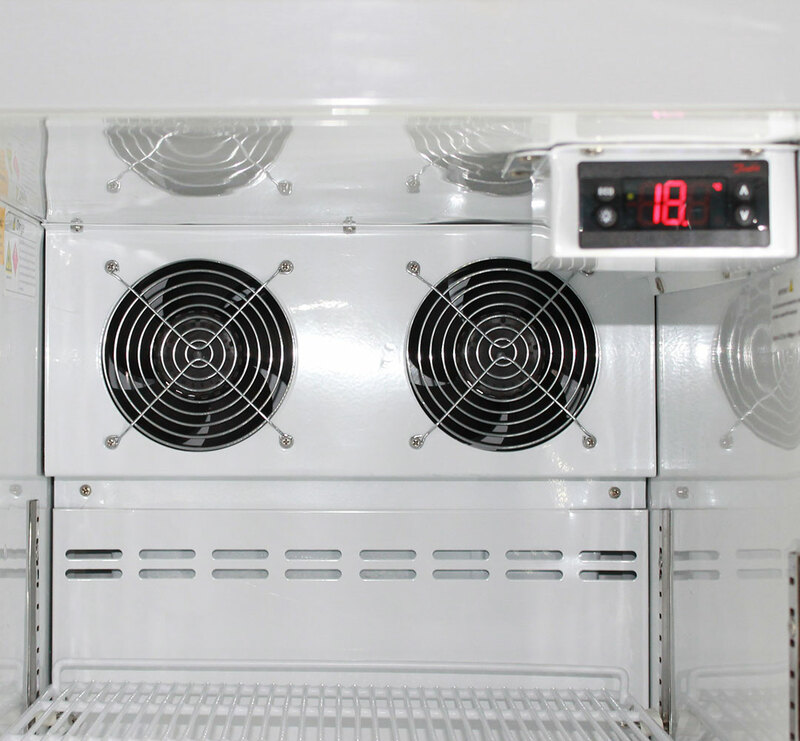 You need units proven to chill in higher temperatures at a good rate, saving working time on parts and energy consumption and $$$. What is condensation and how might it effect my fridge? 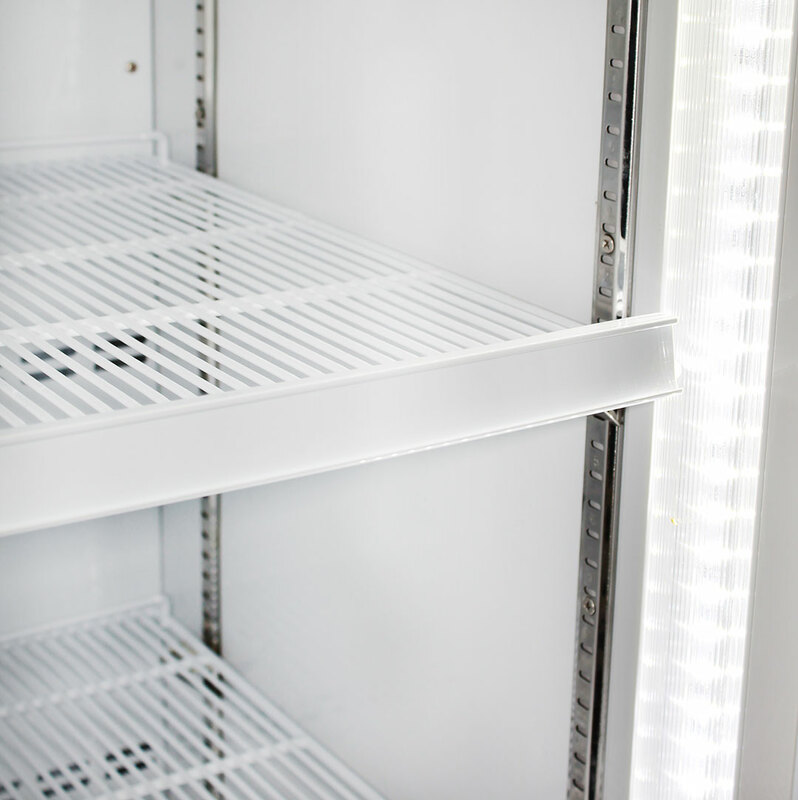 Did you know that glass door fridges form condensation (water) on the outside of the glass in areas with high humidity? This not only gives a bad look, but can cause water to form on your hardwood floor, causing irreparable damage or making tiled floors dangerously slippery. Not a lot of people realise this when buying a glass door fridge as really in the past glass door was only used for commercial refrigeration in shops and stores etc. But now with the ever growing renovation boom and alfresco area take off glass door fridges are becoming an edition all houses have and need. Condensation forms basically when there is water in the air (humidity), and because the interior of a fridge is cold, the glass becomes cold too, and this combined with humid weather outside the fridge causes water to form, like in the early mornings you see inner house windows fog up, the glass is still so cold from outside that the water forms on inside. Normal dual glazed (2 x panes) fridges with just normal glass will start to condensate in about 50-55% humidity, this is market standard and these will pour water in anything over 65-70% humidity. Triple glazed units work better as the front pane doesn’t get as cold because we have 3 x layers not 2, so generally 60-65% is pretty good before condensation starts to form. 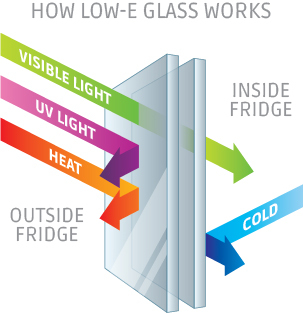 Then we move into LOW E glass, this is a special coating that goes on the glass that reflects heat rays 70% better, it basically keeps cold in better and assists in keeping outer glass warmer. Mostly LOW E will achieve up to 70-75% before condensation starts to form. Argon Gas Fill – This process is in a lot of units and helps protect front glass from getting cold as it provides a layer in between the 2 x panes of gas, this combines with any of the above will help a minimum of another 5% before humidity forms. 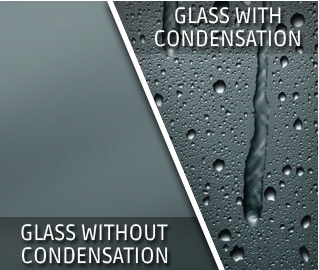 Heated Glass – The only way to 100% stop condensation on glass is heated glass. This uses a film that is electrically charged at low voltage with power of about 50-65Watt, so this actually at a minimum doubles the energy consumption of the unit, most are 3 times the energy. This can however stop condensation on the body or door frame which is also very, very common. Condensation on the body and door frame is very common in cheaper units. Foaming processes of inner body insulation are very slap happy in a lot of factories and a poor foaming job can cause all sorts of condensation issues, especially if the unit is stainless steel. 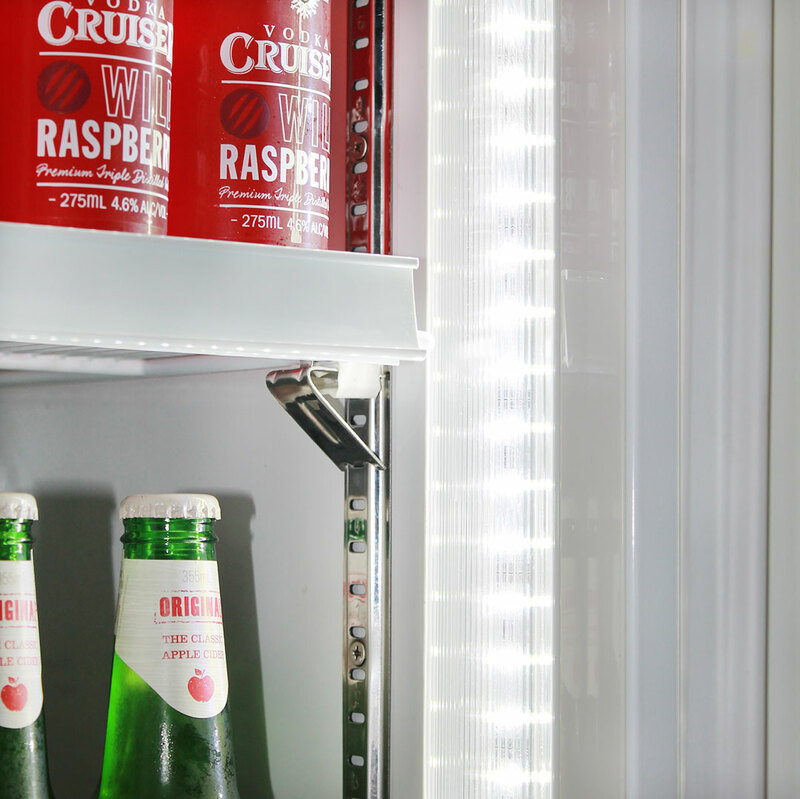 Coldness can still get from fridge to parts of door frame and sides of fridge, this can then condensate just the same way that glass can, so it’s important to ensure your supplier also has this covered. There are ways to combat that by having the hot pipe part of condenser channelled through the inner walls. So that was a brief lesson on condensation, so people don’t get caught out not realising what they are buying, especially in areas north of Sydney, Gold Coast and Far North Queensland where humidity is constant at 90% or above for a lot of the year. Definitely our biggest complaint over the years is noise levels. The recent new trend of having glass door refrigeration is popular but a lot of people really do not know what they are buying, as it was never really an available product for home applications 10 years ago. Now that it is very popular you have to be wary of the location you are placing it and what noise levels it does run at. Everyone’s perception of noise is different and so it makes it difficult to explain noise. A common metric is the ‘Decibel Rating’ known as dB, this gives a figure that can be compared to other appliances to help get an idea. 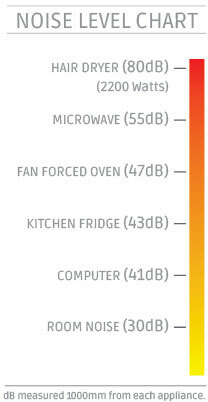 The scale is very odd to understand as about 25dB is actually nearly silent, 36>43dB is a household fridge, yet only 55dB is like a microwave. See the chart we compiled using basic household items in 5 x different homes and taking the medium. As you can see a hair dryer is 80dB, now that is loud, very loud, yet room noise is only 30dB, this is a room with nothing on or going, basically nothing. Domestic fridges can range from 36 to 43 depending on brand and compressor and age, an older fridge often runs with a noise that you just get used to, but most are no more than 43dB. We have a lot of units that we specially fit 12V quiet (silent) fans to, these are from an Austrian company and run silent at 20-29dB, really making noise levels very low. We also have more commercial type quiet fans that run at 39dB compared to standard commercial fridge fans at 55dB. As you can see from the chart the difference between 39dB and 55dB is huge. There are many variables that can alter the noise level of your fridge, we have talked about fans but the main compressor can also be the part that causes the grief. Depending on compressor type or size they can still run from 39dB>55dB, so even with quiet fans you may still have times of higher levels of noise during run times. Other variables are things like the room the unit is located in, a ‘hard’ room with hard wood floors will reverberate noise much more than a soft cushiony type carpeted room. The cavity where the fridge sits can also cause more noise enhancement so little things like ‘lining’ the rear wall with foam or sitting the fridge on a rubber mat can also make a difference. Triple glazed and solid door units also keep inner noise contained and units with plenty of space ‘in front’ of them can also be slightly less noisy - this allows the noise to dissipate into the environment. Alfresco fridges used outdoors work extremely hard and build up a lot of heat during normal cycling up/down in hotter ambient temperatures. What this means is that bigger fans are needed to expel the extra heat in a timely manner so the unit can run efficient while chilling, so in general alfresco units will be louder because of this reason. We can alter fan system in these too quieter, but quieter means slower RPM (Revs Per Minute) and less air movement making it take longer to get units down to temperature, hence more power consumption. So we can make units quieter and they are still ok but the trade-off is more energy consumption. 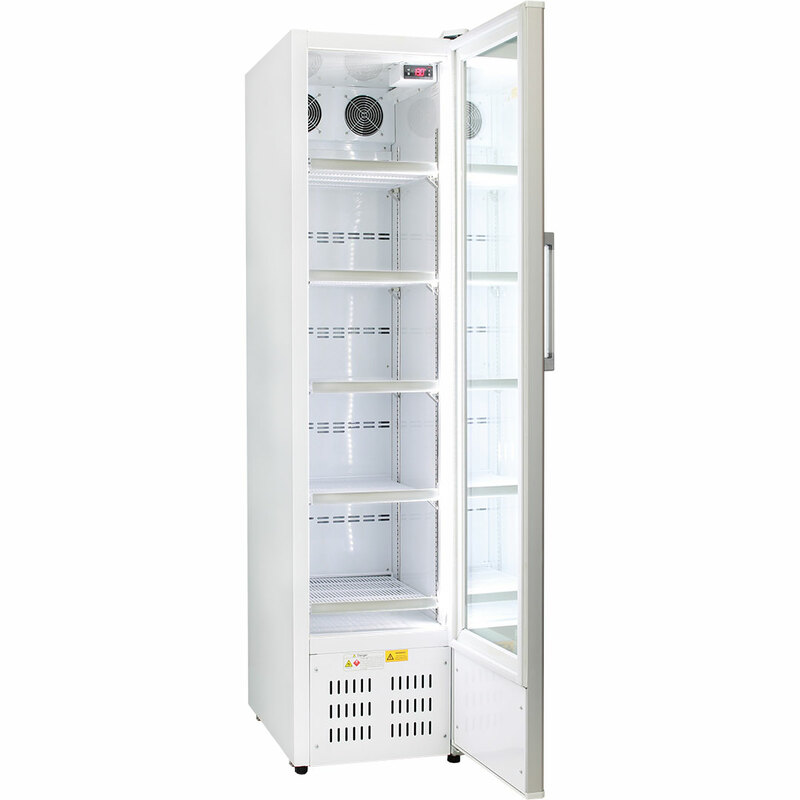 This same principle applies to commercial units which often have many door openings and high usage so quicker chilling function is better for units in harsh applications. So anything is possible and we do plenty in this area to make units as quiet as possible and to offer options, there are just all these things to consider before you make such a high $$$ purchase. If you are building this fridge in, your cavity will need to be at least 530mm wide, 1895mm high and 868mm deep. This site uses a secure, encrypted payment gateway for all transactions made through eWay or Paypal. We also accept direct deposit, cash and cheque. Did you know you can Pimp Your Fridge? Frothy Jingle Voted Australia's Number One Radio Ad Hip Tune! 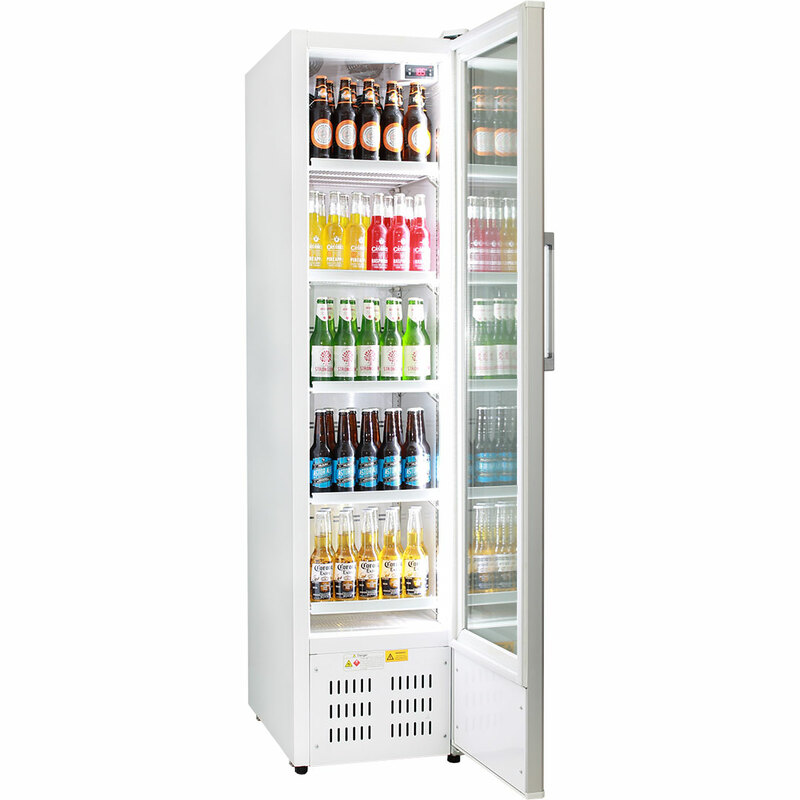 Australia's Best Glass Door Bar Fridges Warranty HITS TOWN! © 2004 - 2019 Bar Fridges Australia.